Where healthy smiles lead to a healthy life! 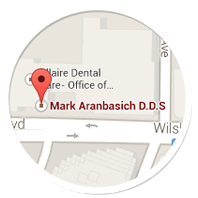 Over the past 25 years of practicing dentistry, Mark Aranbasich, DDS has grown his business with the primary focus on delivering the best in patient care. Through this experience, Dr. Aranbasich and our team have developed a commitment to the highest level of dental health and treatment that is personally tailored to each unique individual. Our goal is to treat our patients’ dental needs with the care and skill in a comfortable environment. The basis of sound dental care is routine cleaning and maintenance. We customize cleanings on the basis of your periodontal (gums and bone) health. Ultimately the combination of hygiene visits and good home care will support your overall oral health. Please feel free to contact our Los Angeles, CA dental office, conveniently located close to Whilshire Blvd and Miracle Mile, to schedule an appointment with Dr. Aranbasich.